Drs. Robert and Heather Heil help Freedom families keep smiles healthy. When you think about a trip to the dentist, you probably think about a dental cleaning and exam. Those two services are the cornerstone of general and family dentistry, but there’s so much more to your dental care than these two procedures. Sure, we want to see you every six months at our Freedom dental office near Kaukauna for a cleaning and exam; these are the keys to lifelong dental health. However, at various points you might find yourself needing something more, and we can offer other general and family dentistry services as well. We go above and beyond the basics at Dental Expressions. Starting at square one, your first visit to our office will likely include a general and family dentistry exam and professional dental hygiene treatment. During your cleaning, we remove the plaque and tartar that causes so many dental health problems, from cavities to gum disease to tooth infections. We’ll look for signs of gum disease and teeth grinding, and we’ll ask you specific questions about various aspects of your oral and overall health. We’ll use our intraoral cameras, digital X-rays, and DIAGNOdent technology to look for tiny problems that might not be obvious during a visual exam or easily found with the dental probe. Dental X-rays can help us discover decay, abscesses, bone problems, signs of cancer, bite problems, and problems with the tooth roots. Technology greatly increases the positive impact of your general and family dentistry visits at Dental Expressions. You’ve surely heard of oral health problems like cavities and gum disease – but what oral cancer? While not as well known, this condition has some staggering statistics associated with it. For instance, one American adult dies from oral cancer every hour on average, and half of the people diagnosed this year won’t go on to live more than five years. Thankfully, the odds of successful treatment are high as long as the disease is caught early on. That’s where our team here at Dental Expressions comes in. During regular exams, we’ll be happy to expertly scan your mouth for any tell-tale signs of oral cancer, including sores, lumps in the skin, and color changes in the tissue. If we find anything concerning, we can help you take the next step towards a smooth diagnosis and treatment. Headaches and other chronic pain problems can originate in your temporomandibular joint, or TMJ. Some people grind their teeth in their sleep, which can cause muscle strain and reverberate to other areas, leading to head, neck, shoulder, and back pain. We offer TMJ therapy to help alleviate the stresses caused by nighttime teeth grinding and other problems that might be leading to TMJ dysfunction. 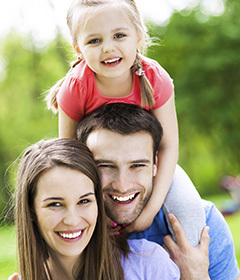 Your general family dentistry wellness depends on complete function, which includes your jaw health. Drs. Robert and Heather Heil know family is important. They have four sons, and they want their sons to have healthy smiles. They want you and your family to have healthy smiles, too. Contact our office to make an appointment with one of our Kaukauna dentists today. Families from all over the Fox Cities, including Appleton, trust Dental Expressions with their general and family dentistry care. People visit our office from Green Bay as well, coming to us for the friendly service and family-oriented atmosphere as well as the convenience.